AT&T's network scope and pricing: AT&T isn't very clear about what they include in various free and fee roaming packages. After consulting their Wi-Fi site and talking to an AT&T spokesperson yesterday, I think I have the story. DSL, fiber, and business remote-access customers (the 12m we've been discussing) get the Basic package included at no cost, which isn't 17,000 (with Starbucks included) but isn't far off. It's McDonald's (8,500) plus Starbucks (7,000) plus Barnes & Noble (several hundred) and a few other chains/venues and airports that AT&T operates itself. Most U.S. hotels and airports operated by other providers require a Premier subscription, which also adds 53,000 international locations. For those who get Basic for free, the Premier subscription is $10.00 per month; all others, Premier is the only option for a subscription, and it's $20 per month. Pricing is explained, but not very clearly, on their Wi-Fi page; you have to look at that page and then at the location finder to sort this out. ...The iPhone: No iPhone update yesterday, but everyone I interviewed was winking slyly. Media in the stores, and Apple: Starbucks chief technical officer as much as told me that Starbucks has Apple media servers in their stores that feed out songs and previews based on what's programmed in the stores. The move from there to caching digital movie rentals and popular downloads is very, very small. I've written a long piece explaining this for Mac journal TidBITS: Starbucks Deal Brewed with AT&T Has Hints of Apple. 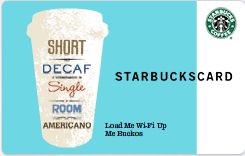 You're going to walk into Starbucks, log onto free or cheap Wi-Fi, and download a movie for rental in a few minutes from the local network. 3G iPhone: Oh, yeah, I predict Starbucks will be part of the launch plan for the 3G iPhone, which I would now wager will appear in second quarter because that's when AT&T will have some markets up and running with Wi-Fi in the coffeeshops. Location: Starbucks CTO Chris Bruzzo also emphasized community, location, and digital experience. He had few specifics, but the idea of bringing in portable devices, like cameras and games, and spending time interacting online in some fashion, yet to be described, with a community that's highly local to the store seemed the theme. He also mentioned location-based services in passing, since each store obviously has a fixed location; T-Mobile was providing some location-based information before this, but more extensive offerings sounds planned. Bruzzo was hip about broadcasting Web services that devices on the network would pick up, instead of talking about a Web browser to Web server equation, which is more laptop oriented. Many devices, one account: You'll be able to use the same account or Starbucks Card code to bring multiple devices online at the same time, within reason. Bruzzo at Starbucks said it would be handled in a reasonable fashion; an iPhone and laptop logged in at the same time wouldn't cause the system to complain. They'll track MAC addresses--that's adapter unique IDs--to avoid real abuse. Wi-Fi as glue between home and true mobility: AT&T also told me yesterday that the abundance of "free" in this deal had to do with cementing a customer's connection seamlessly along whatever they do. Joe Izbrand, a spokesperson, said, "The benefit is in our ability to continue to big the largest Wi-Fi connect, to deliver converged connectivity across the board, it's part of what we're trying to do to keep people connected no matter what they're doing, on the home, on the road, whatever. In the competitive marketplace, that's a real differentiator." T-Mobile and Starbucks: As noted yesterday, T-Mobile data subscribers will have fee-free roaming access onto Starbucks when the transition to AT&T happens in each store, for now and "for years to come" according to a revised statement released late in the afternoon yesterday by T-Mobile. The statement also clarifies that T-Mobile HotSpot@Home customers who use the converged cell/Wi-Fi handsets for calling over either kind of network will also be included in this. The deal lasts "at least the next five years." I don't have details on this, but I have been told that the transfer of provider was abrupt, and I suspect that Starbucks made this a condition of the AT&T deal to avoid any of its customers being upset by a service transition. While numbers of monthly subscribers have never been released, it's likely in the 100,000 to 125,000 range. I can't see many fewer, and it's hard to see decisions T-Mobile made if the number was much larger. Wayport's catbird seat: The first person I called when I heard about the deal was Dan Lowden at Wayport, a long-time executive who has been through all the changes in the market. Wayport is AT&T's managed service partner, and has the direct contract with McDonald's, to which Wayport resells access to AT&T; they're picking up 7,000 more locations to manage through this deal. "I think this is some of the biggest news in the industry ever," Lowden said, and I am loathe to disagree; the only other news that might qualify as "bigger" were failures, such as the shutdown of Cometa, which ultimately has made little difference in the market's evolution. In fact, the original Starbucks deal with MobileStar in 2001 was one of the factors that launched hotspot deployment at a faster pace. I asked Lowden about the role of mobile devices in their networks. "We work with a lot of these device manufacturers as they're coming to market" to ensure a good connection experience, Lowden said.